DIYLILCNC Presentation @ 3pm; Demos before and after. This notion of infinite reproduction, coupled with the idea that the machine become self replicating is a powerful metaphor – one that artists and engineers alike are currently experimenting with. Whether it’s making the tools to make the art, or making the art with the tools we’ve made, or making the art with someone else’s tools there exist many possibilities and options for designers and artists to interact with new digital fabrication techniques. 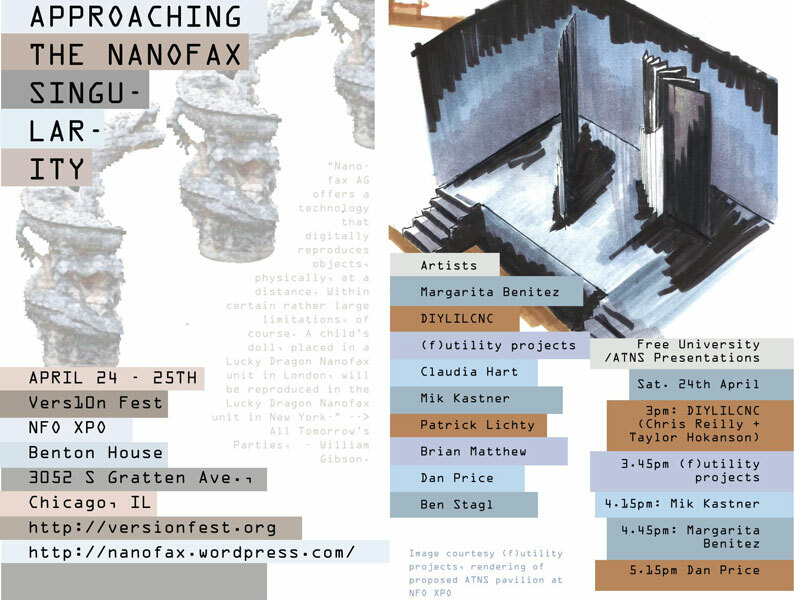 Approaching the Nanofax Singuarity (ATNS) seeks to show case some of these artists currently working in this field here in Chicago. DIYLILCNC is a collaborative project by artists Chris Reilly and Taylor Hokanson.Their project is a low cost open source DIY 3 axis CNC mill. Chris and Taylor will demonstrate the machine and talk about CNC technology in general, some of the shortcomings of the present state of CNC and how those are addressed by open-source hardware projects like the DIYLILCNC. We’ll also go over the specs of the DIYLILCNC, giving details about how it is built and its functions.